That was the concise review for those who prefer things short and sweet. Sadly, the Metal Observer chiefs won’t stand for a three-word review, however appropriate it might be. Besides, anyone who does prefer things short and sweet is going to want to give Shape Of Despair’s fourth album, Monotony Fields, a miss. It’s long, it’s slow and it takes a few listens before it eventually starts to reveal its wonders, but it’s well worth your patience. 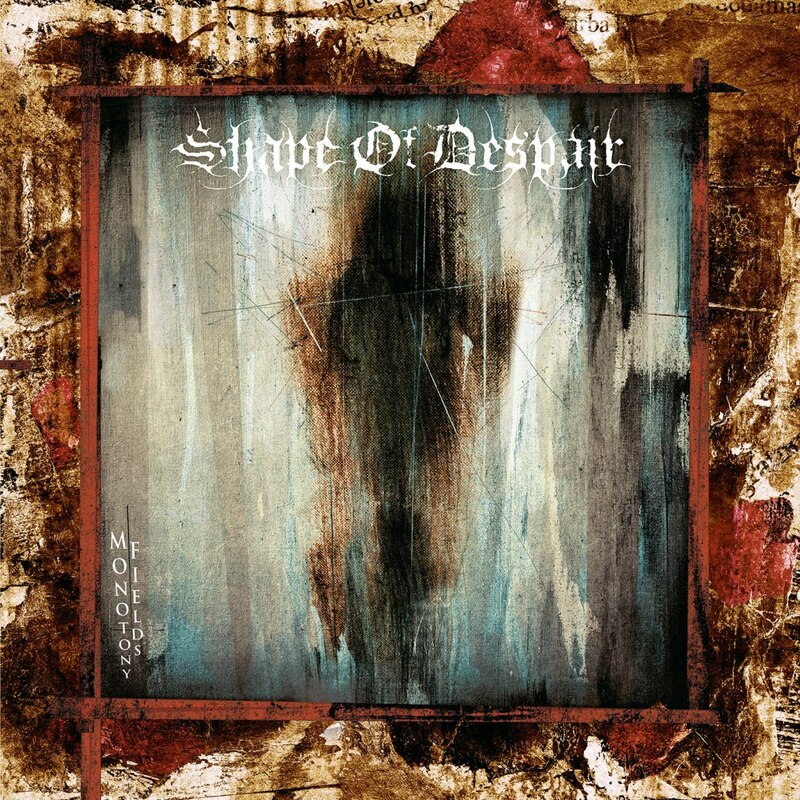 Shape Of Despair formed in 1998, releasing three albums, the most recent of which was 2004’s Illusion’s Play. Having had over ten years to follow that album, it might be reasonable to expect the band to produce their meisterwerk. Do they achieve that? To quote the band’s Facebook page, “Reinvigorated by the addition of new vocalist Henri Koivula and a freshly inked deal with France’s Season of Mist, Shape of Despair are set to begin anew, delivering yet another monolith of morosity.” A monolith of morosity it most certainly is, and surely the band’s finest hour (and a quarter). The music contains the standard funeral doom/death elements: crushing yet crawling rhythm section, melodic keys, thunderous, indecipherable growls and occasional clean vocals. The quality of the songs, though, is far from standard. Shape Of Despair’s ability to craft stunning, epic pieces of music is evident right from the outset. Opening track, “Reaching The Innermost” is a steady build up, with gentle, atmospheric synth joined by a heavy, measured rhythm section, then melodic piano, which gives way to deep growls. Female “ahhhh” chanting adds melody and beauty. It’s a good introduction to 2015’s Shape Of Despair, but comes up just short of brilliance. There’s a faint sensation of something missing; it’s an excellent song, but creates a feeling that it is building to something; a climax that never quite arrives. The title track consists of the same elements, which ‎although expertly done, is the problem. It’s immense and ponderous, but is also over ten minutes with very little variety and adds nothing we haven’t already heard with “Reaching The Innermost”. This may not be the most triumphant opening to an album, but it improves dramatically from here. Although there are a couple of tracks later on that could and should be shorter, notably the near-twelve minute, “The Blank Journey”, the title track is the only truly dispensable number. “Descending Inner Night” adds something new, with female singing rather than chants, although like the growls much of it is indecipherable. It is, though, quite uplifting and a great contrast to the heavier vocals. “The Distant Dream of Life” and “Withdrawn” represent the strongest period of the album and, probably, the band’s career. Both tracks are exceptional, the former featuring clean male singing, which has a haunting shoegazing / indie rock sound to it that brilliantly complements the heavy guitars, harsh growls and melodic, beautiful keys. ‎At six minutes, it’s a little ditty by Shape Of Despair standards. “Withdrawn” is simply stunning, with minimalist, but gorgeous, piano and resonating acoustic guitar perfectly complementing the heavier elements. Final track “Written In My Scars” is also worthy of a special mention. While the quality is good throughout, the two tracks described in the previous paragraph along with the album closer complete of a trilogy of truly astonishing pieces of doom brilliance. The powerful, grandiose piano-accompanied rhythm section at start is ‎like the soundtrack to some momentous event or biblical epic. It’s devastatingly moving, somehow managing to be both gloomy and rousing at the same time. Fittingly, the song and album end with more of those female “ahhh”s and gentle lead guitars over the trademark heavy rhythm section. Monotony Fields is a work of funeral doom/death genius. Some persistence is required before its charms are truly unfurled, but there’s no better soundtrack to deep, profound ‎reflection in 2015. Slow music doesn’t get better than this. This entry was posted in Featured Review, Reviews and tagged featured, finland, funeral doom / death, helsinki, Henri Koivula, Monotony Fields, Season of Mist, Shape Of Despair. Great review , I agree with Reviews posted personally the climax is on the theme " in longing "